The Dietrich Undergraduate Colloquium (DUC) is a unique opportunity for students with a major or minor in the Dietrich College of Humanities and Social Sciences to present their projects, creative work or research in a formal, but low stakes setting. Students interested in participating can submit a proposal by Oct. 10. The colloquium is open to any undergraduate with a primary or secondary major or minor in an area of study within the Dietrich College. The student’s proposal can have any content, and it can be about ongoing or past work. Previous DUC participants and attendees have had positive experiences with the fairly new program. Comments have ranged from saying that the DUC “was a good experience to put me outside of my comfort zone and force me to talk in front of an intelligent audience” to agreeing that it was a good opportunity to practice presentation skills and to give and receive feedback from people across a variety of disciplines. For more information, including proposal guidelines and information on previous DUCs, visit the DUC website. 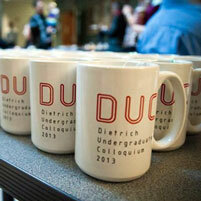 View photos and learn more about the first DUC.